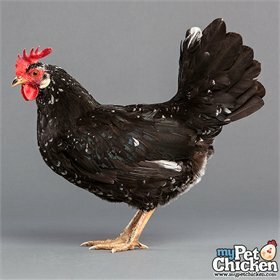 The Ancona has a "mottled" color pattern of black with white spots, and both Single Comb & Rose Comb varieties are accepted by the American Poultry Association. Like other Mediterranean breeds, Anconas are closely feathered, active, good foragers and good layers. The Ancona is also extremely hardy in cold weather.